Thanksgiving brings with it many variables. Once you put together extended family, food, and football, there is a lot of room for things to go south. The ideal scenario is that everyone sits peacefully to break bread together, reflecting on what they appreciate most about each other and basking in the pure joy of family togetherness. Real life is your cousin talking politics even though Grandma finds it impolite. Real life is the kids complaining loudly about Aunt Martha's green beans and feeding them to the dog. Real life is the obvious silent treatment going on between your brother and sister-in-law—a tension so thick you could cut it with a knife. 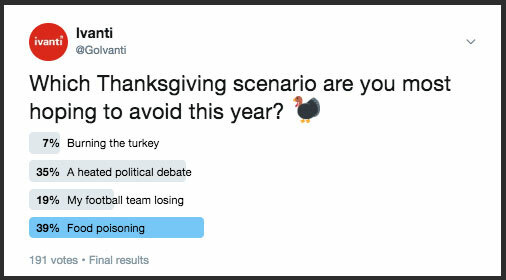 Clearly people have had some traumatic experiences with food poisoning, which was the top response coming in at 39%, followed by a heated political debate at 35%, their football team losing at 19%, and burning the turkey at 7%. And because we love polls at Ivanti, we didn't stop there. We asked our customers a few questions, too. Try not to let your mouth water as you read on. I want to taste that turkey! Celebrating in October! A full month before our southern neighbours. We dont have that tradition here, but it would be to eat! Sorry, no Thanksgiving in Holland. I don't know because in Europe it's not tradition. Going to hometown to spend quality time with family and have some crackers. What Ivanti functionality are you most thankful for? Rollout projects for auto-patching. I can take the week off and still have secure devices! Thank you to all of our wonderful Ivanti customers!